When it comes to pointless pursuits in the name of art, the Italians have hit a new high. I’m not sure what, as a spectator, I will precisely see; presumably a soggy Italian bobbing up and down between the oil slicks and the buzzing Indonesian ferry-boats with an inflatable easel and waterproof paints will be there somewhere, but if he’s a mile off-shore (and why this sudden move of the Italians to Imperial measures? ), even the most powerful binoculars are unlikely to offer conclusive evidence of his feat. There is a fine tradition of great artists coming from Italy, and it is good to know that the heritage of Botticelli, Canaletto, Caravaggio, Leonardo da Vinci, Giotto, Michelangelo and Raphael continues with Signor Cristini. And if Canaletto, for example, never thought to swim in the Grand Canal while painting scenes of Venice or in the Thames while committing Westminster Bridge to canvas, more fool him! I want to see one of the great Italian painters at work, and if I have to do so from a man-made beach in the South China Sea and through a high-powered telescope, that’s a small price to pay. There again, it may all be a joke. And I’m all for that. There isn’t enough humour in the arts, and while commentators moan and groan about cutbacks, paltry government funding, lack of interest, blah, blah, blah, I think a good belly-laugh is what’s needed to encourage us to enjoy art rather than complain about it. Music, luckily, has always had its sense of humour. Percy Grainger was a fantastic composer, but gave us all (and continues to do so) a good laugh along the way (I still double up with mirth when I recall Andrew Davis carrying on a life-size cardboard cut-out of Grainger to the stage of the Royal Albert Hall when he conducted a live performance of the Grieg Piano Concerto where the soloist was Grainger’s own piano roll), Haydn’s jokes still cause a chuckle while Malcolm Arnold had the knack of turning the ridiculous into enjoyable music. 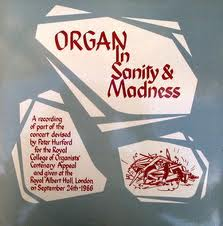 The wonderful RCO celebration in 1966 – Organ In Sanity and Madness – showed that organists could laugh at themselves, while Gerald Hoffnung’s cartoons still adorn music studios the world over with their hilarious caricatures of musicians at work. And almost exactly a year ago I reported in this blog about the antics of one Stefan Aaron who liked to play his piano on tops of mountains. The theatre is, of course, full of humour, and a preponderance of silly sculptures in unexpected places gives a lovely touch of humour to travelling around Europe. I’m not so much into dance that I recognise humour or satire there, but I’m told it exists. So it’s only in painting that humour seems in really short supply. So we must be grateful to Signor Cristini. There remains, though, a niggling doubt. Might this actually be a serious artistic endeavour? Surely not; nobody would be that weird, even an Italian painter. All the same, I’ll be there, cheering on this modern-day water-colourist from the beach, glass of Chianti to hand. Italian artist Alberto Cristini recently swam from Alcatraz to Crissy Field while pulling two performing musicians with him. Adding to this, he crafted drawings during his swim, a seemingly impossible task. In true representation of art within nature, his moving exhibition was captured on video. Seeing the team shiver at the end of the video reminds us of just how difficult their journey was, and that creating art is often as physical as it is emotional or mental. It also shows humanity at one with nature, while exhibiting the idea of "escape" that Cristini sought to convey. A photo seemed to show that the hardy musicians were a trumpeter and a percussionist. Enjoy the event. And I look forward to any subsequent musings that this may inspire on what is art and why.